Do date night right at DC’s first winery. Enjoy a tour, wine tasting and waterfront dining. Whether you’re planning a first date, a long overdue night out, or simply need a unique date night idea—look no further. 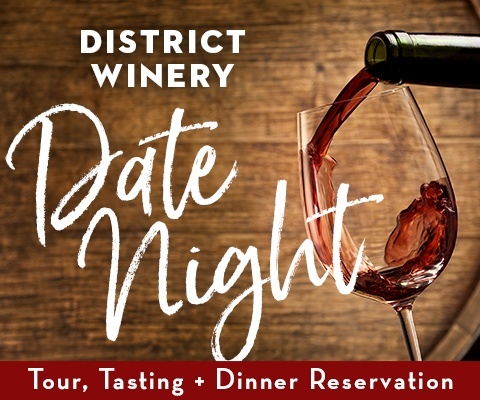 Revel in romance at District Winery. Start with a Tour of the winery, then sip and swirl as you taste your way through seven District Winery wines. As you sit down for dinner at our onsite seasonal American restaurant, Ana at District Winery, enjoy your first glass of wine on the house. *Package includes dinner reservation only and does not include the cost of dinner. Regular dinner menu available only for a la carte selection. **Guests may select any wine from our list of wines by the glass.